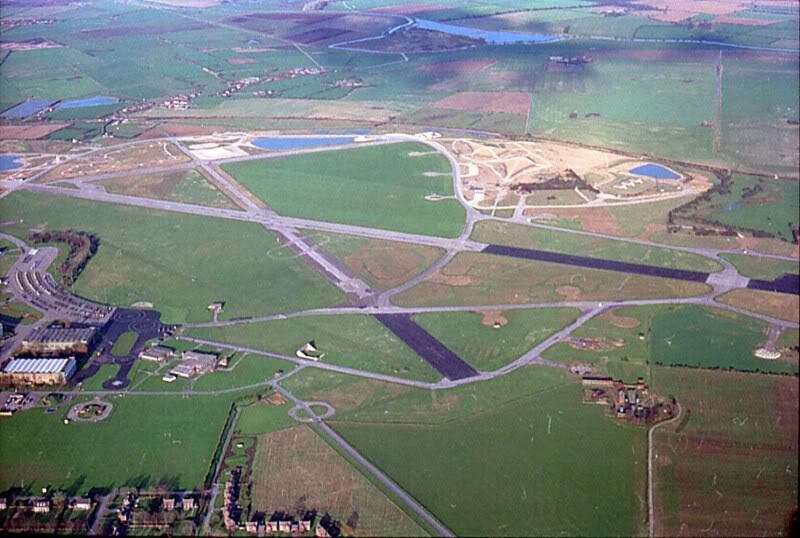 Leconfield air field (RAF Leconfield) was an airfield 265 kilometers north of London. Construction of the airfield was completed in December 1936 after more than a year of building. Designed to be a bomber airfield, it featured 5 large hangars. Four of the hangars were built fronting the 'bombing circle', while a fifth was placed behind them at the south end. The first squadron that arrived at the airfield was 166 Sqn, in early 1936, and the second, 97 Sqn, arrived a month later. Both units were equipped with Heyford biplane bombers under control of 3 Group until 4 Group was formed that summer. In the summer of 1938 both squadrons lost their front line status, when they became training squadrons for air observers. Somewhat later they became so-called 'pool squadrons' and as such they had a low priority for re-equipment. Although they had received some Armstrong Whitleys in the summer of 1939, the squadrons still operated biplanes when war was declared later that year. After war had been declared in September 1939, the bomber quadrons moved to RAF Abington and Leconfield became a Fighter Command airfield under command of 13 Group. Two Spitfire squadrons arrived in the fall and 16 more rotated through Leconfield over the next two months. In early 1941 preparations had begun to receive bombers again, by laying out three concrete runways. The three runways (01/19, 05/23 and 14/32) were all built at 1300yards in length, but 01/19 was soon lengthened to 1520 yards. The taxitrack (or perimeter track, as it is called in England) featured 36 'pan'-type parkings dotted all around it. However, as soon as the work was complete, another lengthening took place to allow heavy bombers to operate from the airfield. At the end of 1941, the airfield was returned to Bomber Command control. Soon the main runway (01/19) was lengthened to 2000 yards, while the other two became 1400 yards long, both lengthened on their southern ends. The 05/23 runway was ending on the 14/42, allowing sufficient height to be gained to clear the elevated Hull to Scarborough railway line. Unlike many other RAF stations that were being reconstructed, the RAF Leconfield camp remained occupied. During the reconstruction period it was used as a school for 15 (Pilot) Advanced Flying Unit and also to assemble and house personnel of the new Canadian No. 6 Group that was being established in North Yorkshire. At its peak, the camp provided accommodation for 2,560 personnel. When the airfield reopened in December 1942, it received 196 and 466Sqn, both flying Wellington bombers. Australian manned 466 Sqn. flew its first combat missions in January 1943, and 196 Sqn the following month. However, as 4 Group was re-equipping to become an all-Halifax unit, the Wellingtons were soon phased out. 196 Sqn ceased operations and moved to Witchford to become a Stirling unit in July 1943. 466 Sqn converted to Halifaxes in the summer of 1943. A second Halifax squadron was formed at Leconfield in January 1944 by establishing a new squadron, 640 Sqn., from the nucleus of 158 Sqn. at RAF Lissett. 466 Sqn was moved to RAF Driffield to help it form another Australian-manned Halifax Squadron. When RAF Snaith was about to close as a bomber station, 51 Sqn. was moved to Leconfield in mid-April 1945. It flew its last operation of the war five days later, as did 640 Sqn. 51 Sqn. then became a transport squadron, and RAF Leconfield was transferred to Transport Command on 7 May 1945 with 640 Sqn. disbanding on the same date. Total Bomber Command aircraft losses from Leconfield during the war were 143. 51 Sqn re-equipped with Stirling transports, which possessed more cavernous interiors. In August the squadron was moved south to RAF Stradishall. 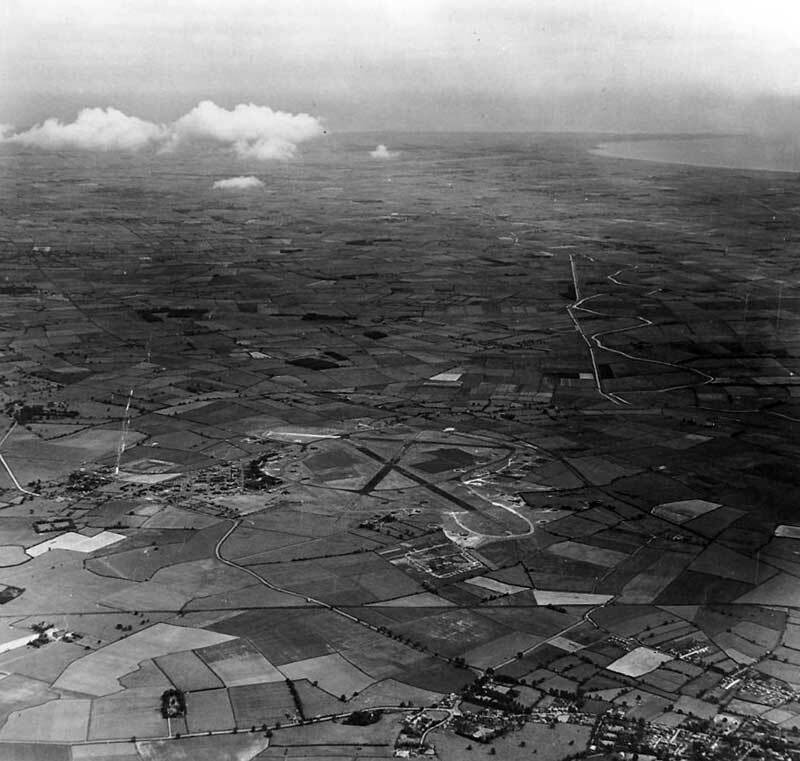 RAF Leconfield from the air in May 1945 (AirfieldInformationExchange). In the 1950s, Leconfield became a 'dispersal base' for the RAF V-bomber force. Additionally, it was home to the Central Gunnery School which, among other functions, trained air gunners in Lincoln bombers after October 1945, into the early 1950s. In 1957 the Central Gunnery School was transformed into the Fighter Weapons School. 275 Sqn (flying Bristol Sycamore helicopters) arrived there in 1957. 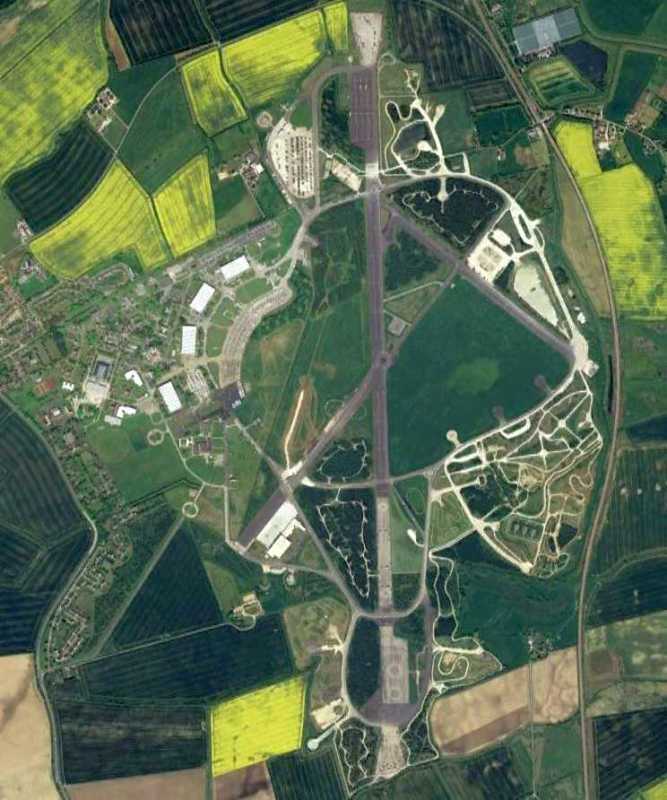 The 01/19 runway was lengthened to 3000yards and for years Leconfield served as a fighter station. 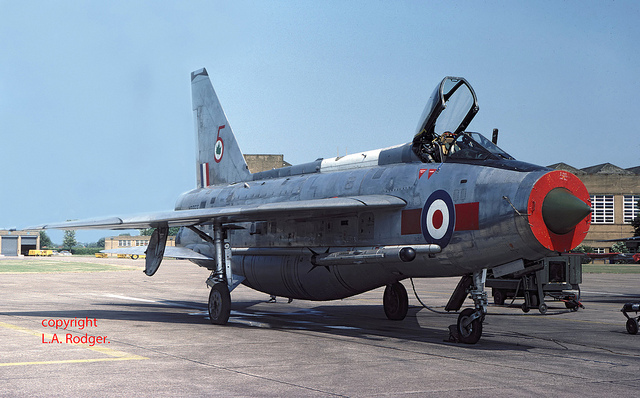 The aircraft then flown were Venoms, Meteors and Javelins, plus twin-seat Vampire T11, Meteor trainers and Hawker Hunters for trials with ADEN cannons in 1957. 275 Sqn was renumbered to 228 Sqn in 1959, after having converted to Westland Whirlwind HAR10 (licence built Sikorsky S-55/H-19 Chickasaw) helicopters. 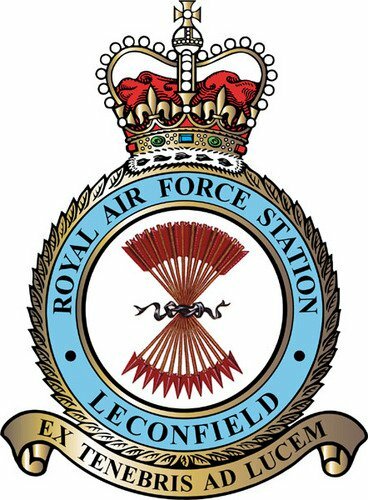 Leconfield became home to 19 Sqn and in 1961 also to 92 Sqn with Lightning F.2s. Additionally, Leconfield became 11 Group HQ and housed the 11 Group Comms flight. In 1964 228 Sqn. was renumbered again, to 202 Sqn. The Lightnings moved out (to RAF Geilenkirchen) in December 1965. Leconfield then became home to 60MU and also 202 'D' Flight with Westland Whirlwind helicopters. 60MU was responsible for the major servicing of the EE/BAC Lightnings, plus several other tasks. 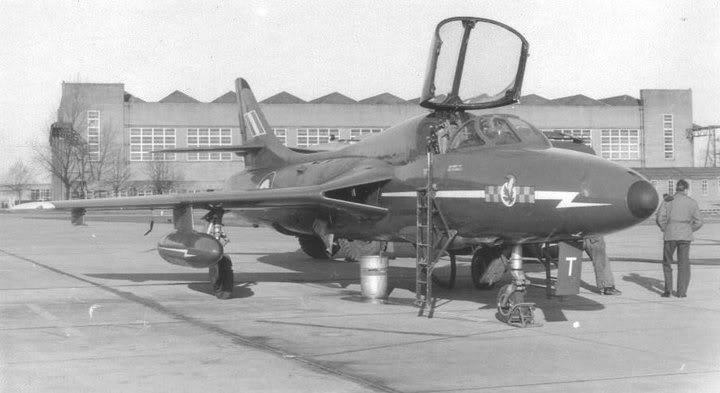 A Hawker Hunter on the platform at Leconfield in 1967 (fightercontrol.co.uk). 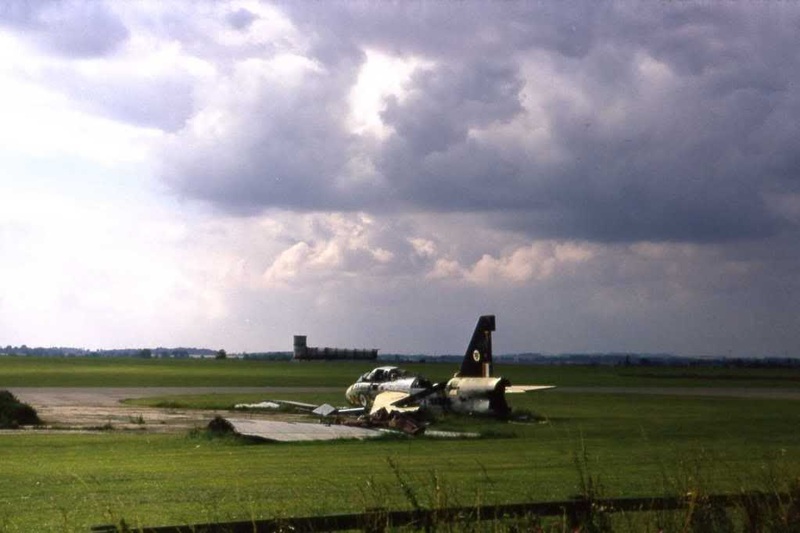 The remains of Lightning T5 XV329 at RAF Leconfield on 22 August 1974 (the Aviation Forum). One of the last aircraft to visit 60 MU at Leconfield was Lightning XR755 in 1976 (L.A. Rodger on Flickr). Leconfield became an Army installation in 1977. Renamed Normandy Barracks, it became home of the Army School of Mechanical Transport (ASMT). Renamed Defense School of Transport in 1996, DST Leconfield is said to be the second largest residential driving school in the world. It has approximately 16km of road circuits plus 26km of off road cross country circuits, including hills (and the famous to it's locals "million pound hill"), a forest and lakes. DST Leconfield has an annual through put of over 16,000 students and can train up to 1,400 students at any one time. DST issues over 10,000 driving licences each year. The runways of the former airfield still exist, now forming part of the extensive road system of DST. 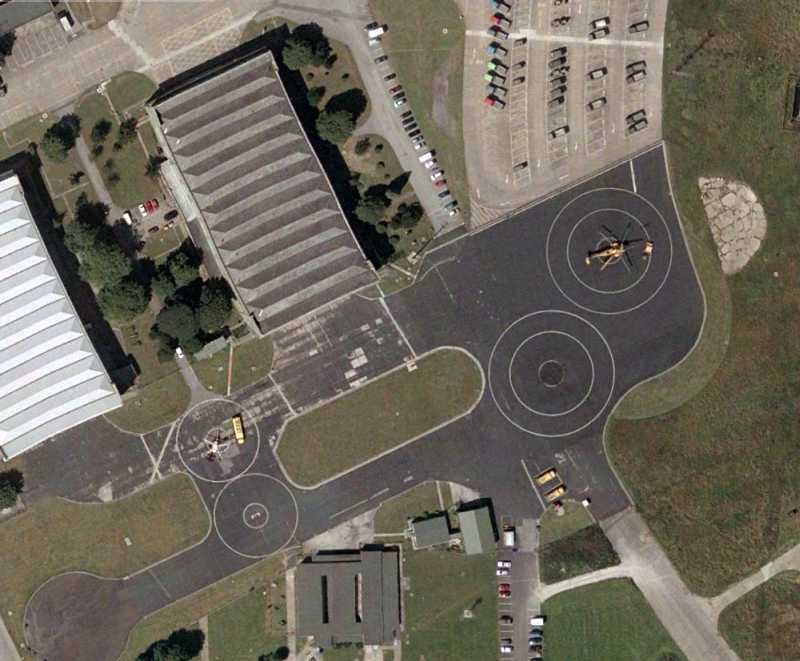 Two RAF Sea King Search and Rescue helicopters of "E" Flight, 202 Squadron are also still located at Leconfield. DST Leconfield in August 1997 (AirfieldInformationExchange). Detailed view of DST Leconfield showing the SAR platforms with a Sea King and an unidentified helicopter in 2003 (Google Earth).